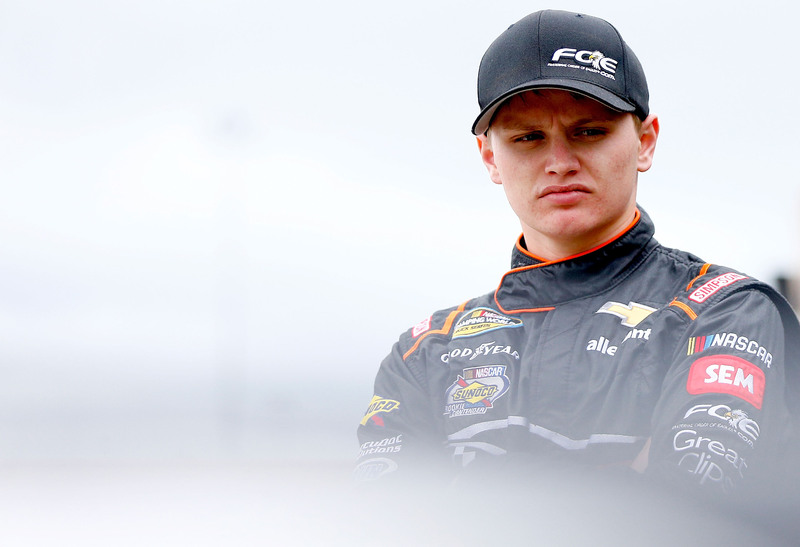 The 12 Questions series of interviews continues this week with Truck Series driver Justin Haley of GMS Racing. Haley won the Truck playoffs opener in Canada last month and is locked into the second round of the playoffs. This interview was recorded as a podcast but is also transcribed below for those who prefer to read. I actually had a dream about racing last night, which is pretty rare, I’d say. I don’t dream about racing too much. I’m a pretty heavy sleeper. But last night I dreamt we won Vegas, so by the time this comes out, I’m sure that’s going to be true or false. (Note: He finished third.) It was a two-in-a-row deal after (winning in Canada), so that was kind of cool. I think there’s a certain level of respect. Normally if it’s not too big of a deal, I just let my spotter know and my spotter relays it. Especially if we’re early in the race, you don’t want someone hot at you. But if you go out there and get into someone, there’s going to have to be some kind of communication the next week. I’d say it’s that I’m a hard worker and dedicated to what I do. I’ve put my all into it since I was a little kid. If I just keep working hard and putting everything into it even if it doesn’t work out, it’d probably be the biggest compliment. There’s some vloggers — I’m pretty big into vlogging. Like Casey Neistat or Roman Atwood. They’re pretty cool. I know Roman did a race awhile ago with Ty (Dillon). I’m not really into the whole scene of music and TV. I don’t watch TV too much, unless there’s a hurricane coming. I always tell everyone if I wasn’t racing and didn’t have to be on social media, I wouldn’t have any platforms. I like doing my own thing and bouncing off my family and friends. Do you have to limit yourself on social media then? I think you have to, to a certain point. I’ve been putting up some Instagram Stories and live videos with Kaz. He’s my best friend. He has a fan base and I have a fan base, so we like to connect them. I do spend quite a bit of time on Instagram — I usually do a post a day to try to engage fans and get my viewership up or whatnot. My tweets are kind of hit or miss. I don’t have a personal Facebook or Instagram, just for racing. Oh, for sure. I’ve gone vegan just to go vegan. Yeah. I think my PR girl and my manager and everyone in my family, they get pretty hot-headed (about his eating habits). I am a very healthy eater. I haven’t had a slice of pizza in a few years. Haven’t had a soda in a few years. Any snacks. Every meal for the past two and a half years has been pre-calculated. It gets hard while racing, but you just have to make smart decisions. I am probably one of the healthiest eaters in the whole garage area — I’d say I probably beat Jimmie Johnson, because I never treat myself. It’s just kind of a lifestyle. I used to eat nachos every day and whatnot. I just found a groove and I like healthy eating. I feel better and I feel like it really affects my performance. Can you give me a quick tip? I really struggle to eat healthy on the road. I don’t even know if it’s healthy foods, but it’s making sure you put the right foods in your body. If I go out to eat at a dinner — like last night, I did with my team — I eat steak and mashed potatoes. That’s not bad. It’s got good carbs; I’m racing tomorrow, so that’s going to be good. It’s got protein in it. I’m not going to eat a cheeseburger. I haven’t had french fries in years. It’s hard to do. Growing up, my parents always wanted me to eat healthy, but I never could until I got something in the back of my head that just wanted myself to do it. It’s more of a want in your head. It’s just a will. 6. It’s time for the Random Race Challenge. I’ve picked a random race from your career and you have to tell me where you finished. This is the 2015 Watkins Glen K&N East race. Do you remember this race at all? I do. I remember it clear as day. Dalton Sargeant was in it and William Byron. I ran third, I’m pretty sure — maybe fourth. Scott Heckert won — he was my teammate — and Dalton Sergeant passed me on the last lap for second. Wow, that’s impressive. You did indeed finish third. You started fourth and led 12 laps. I did lead? That’s kind of impressive, I didn’t remember that. But I was pretty salty. Even Sargeant, when he was my teammate this year, we’d always go back to that race. I mean, there’s probably not too many races I couldn’t remember. Do people usually struggle? It’s kind of 50-50. Some drivers can’t really remember and others can remember clear as day like you did. I remember he shoved in my right-rear fender going into Turn 1 on the last lap. Then I hit him on the exit of the corner, and he had his tail cone flying after we got out of the carousel — his whole rear bumper flew off and hit my windshield. Here we go back to the questions about musicians and whatnot. (Smiles) I don’t even know who rappers are these days. I’ve got no idea, to be completely honest with you. 8. Who has the most punchable face in NASCAR? Two people have said you for an answer this year. Noah Gragson said you and was serious about it, and then Kaz Grala said you, but he was kidding. I don’t believe in violence. I like racing and beating people on the track, but I don’t ever find myself just going straight up and punching someone. It’s not really my style. I’d rather go talk to someone and have a conversation and become buds or something. Is there still any bad blood with Gragson? I’m good. Obviously Noah is a very aggressive racer and he likes to win as much as the next guy. I’m cool with Noah. I’m about cool with anyone in the pits. We race each other 20 weekends a year and you have to see them that much, and you just can’t have any bad blood with anyone. Life’s too short to do that. I’m good with everyone. I might be a little hot-headed after a race because we put so much into it, but at the end of the day, life is too short to hold grudges. Well I think Taylor is definitely my motorhome driver. That’s a no-brainer. (Laughs) And I think we all know the reason why. I think Tom Hanks would definitely be my crew chief. And then LeBron would be on top of his game (as a spotter). He’s taller than everyone, so we’d never have trouble looking over anyone to see. I don’t think I’d be a good spotter, because I’m so short that I couldn’t see. You hydrate yourself so much that you always have to pee, until you get far enough into the race that you sweat it all out and don’t have to pee anymore. Usually I use a nicer restroom — if that’s the media center or whatnot — before I go to driver introductions. Then on the ridearounds in the trucks, you have to go again, so you just have to hit a port-o-potty because it’s the closest thing. Then you’re missing the national anthem and you have to run out. I think it’s whatever is easily accessible. 11. NASCAR decides they would like the highlight reel value brought by the former Carl Edwards backflips and want their own version. How much money would they have to offer for you to backflip off your truck following your next win? I can do a front flip all day long, but I didn’t know how to do a backflip. We were on the boat one day — it was me, Kaz and some friends. I’m like, “I’m going to do a backflip.” Kaz was like, “Whatever.” So I did a backflip and ever since, I’ve totally sucked. I cannot do a backflip. I’ve tried it from five feet up and I still can’t complete the full rotation. So if you ask Kaz, it’s unbelievable. No. It’d be enough money to have neck surgery. I’d really have to up my insurance rate. I know (Daniel) Hemric can do it and hasn’t gotten to do one (after a race) in a long time. I’m good friends with Hemric, so I’d like to see him do it. 12. Each week, I ask a driver to give me a question for the next interview. Last week was Clint Bowyer, and it was kind of a weird question. Does he even know who I am? I don’t play Fortnite either. Anyway, his question was like, “How does it feel to get beat by a guy like me who is so crazy?” But you don’t race with him. I like Clint. He’s pretty down to earth. He’s a cool guy. Look at his playoff emoji. It’s a trucker. How much more down to earth can you be? The next interview I’m doing is with Timmy Hill. Do you have a question I can ask him? (Looks up Timmy Hill’s Twitter profile and sees a picture of mustache he grew for Darlington throwback week) As a 19-year-old driver who can’t grow facial hair, ask him how long it took him to grow that. Honestly, I’m kind of jealous. Each week, I ask a member of the racing community to shed some light on their career path. Up next: Bronson Butcher, mechanic and tire specialist for GMS Racing and a part-time driver. These interviews are recorded as a podcast but also transcribed for those who prefer to read. What do you do right now with GMS Racing? I’m the tire specialist and mechanic on the No. 23 Xfinity car for GMS Racing. People may have just picked up right there on your accent. It’s not the stereotypical Southern accent people hear in NASCAR. Where did this whole thing start for you? I’ve kind of lost my accent by now, but I was born and raised in Australia — a small country town in Australia. There wasn’t much racing heritage in my family, but my parents were always rev heads and we’d go to the V8 Supercar races, the dirt racing, drag racing, all of it when I was a little kid. I decided I wanted to get into racing myself and started racing go-karts when I was 8 years old. Just been doing it ever since then. My first trip to America was in 2006. I went to Phoenix, Arizona, through a series of events. I won a state championship in dirt racing in Australia, kind of got invited to race in Phoenix and that was the first time I ever got the experience of NASCAR. Until then, no one had ever heard of it in Australia. It was kind of an unknown thing across the pond. From the first time I watched the Cup race in Phoenix in 2006, I knew that was what I wanted to do ever since. When you first started with the go-karts there, what’s the karting scene like in Australia? Are there tons of people doing it? Is racing a big sport there? It is. It’s just as serious as it is here in America. Everyone takes it real seriously. But the kind of tradition there, especially when I was growing up racing, everyone wanted to make it to F1 or V8 Supercars. It’s all road course racing. There aren’t any asphalt (oval) speedways. If you want to do speedway racing, you’re in dirt, sprint car stuff, which is really big in Australia too, but I was always into asphalt. Since I first saw NASCAR in Phoenix there, I just knew that was what I wanted to do. It was actually the same year Marcos Ambrose made his rookie season in Trucks, and so kind of until then, no one had ever been to America to race NASCAR. For the next few years, 2008, ’09, and ’10, I raced, I’d come over to Las Vegas, raced Legend cars with T.J. Clark and his Spencer Clark-driven race team, and it kind of just snowballed from there. What about NASCAR appealed to you that you’re like, “Wow, this is really cool, more than V8 Supercars and sprint cars?” Why NASCAR? I’ve never seen racing that was so close, like two-wide, the whole field was nose to tail. Just the whole experience, the fans, I’ve never seen that many fans at a racetrack before. The motorhomes, tailgating as far as you can see. That’s just something you don’t get in road course racing, really. It’s all about once they get through the first lap, they all spread apart and the race kind of settles that way. But yeah, NASCAR is unlike anything I’ve ever seen, just cars racing that close. They’re so competitive, especially back in 2006, those 15 guys racing within tenths of a each other, racing for a win. Any one of them could have won. So that was really impressive to me and a real eye-opener. You said you would come over and do Legend car stuff. Was that with the intent of, “OK, I’m gonna get better on ovals and learns how to do oval racing?” Or at that time, what were your career goals and where did it go from there? I’ve always — and still do — want to make a career out of racing. Cup racing is obviously the pinnacle there. So while I was finishing high school, I dabbled around in Legend car racing and Late Models. Raced a few Late Model stocks at Irwindale Speedway and the Bull Ring in Las Vegas, and when I finished high school in 2011, I packed up and moved to Mooresville, North Carolina. The opportunity wasn’t there for my parents to move just with the whole visa situation — it’s not simple. But kind of got my start in racing with GMS Racing. I obviously needed a job to pay the bills and all that and started work there as a mechanic and just tried my hardest to find sponsorship, find a ride, just get my foot in the door, make sure people knew my name. And so you’re still doing racing, as you mentioned, when you can. Obviously I’m sure this has to come first, your road life. When do you find time to race and how’s that going? So my first race was the Thanksgiving Classic at Southern National Motorsports Park last year, and we finished second. Had a bunch of the guys from the Truck teams and the Xfinity teams come help me that weekend. We had a lot of fun and Mike gave me the chance to (race) anytime I can make it to the track this year. So I did a race at Cordele (Georgia), the SpeedFest at the beginning of the season. Was having a good top-10 run and got caught up in a mess on the restart. And then had a fifth-place run at Concord a couple weeks ago. But obviously, it’s like you said — the road life is what pays the bills so I’ve got to keep chasing that and hopefully we have a few off weekends towards the end of the season and we’ll go racing more. You mentioned the visa situation. It’s obviously a little bit harder for you and your situation to just pack up and fly across the globe essentially and leave your family behind. What were some of the difficulties in doing that and has that been hard for you still to this day? It is difficult. Obviously I’ve got a few more barriers than a lot of people to cross when it comes to living here and trying to make a living. The visa and immigration stuff isn’t easy, but it hasn’t really slowed me down any. It’s funny, it comes up in conversation with my dad every once in awhile — when I was first trying to race in America and trying to make it over here back in 2008, 2009, we never had broadband Internet. We were still using dial-up where your phone rings when you try to connect to the Internet. Those times were miserable, it’s like to load a webpage was five minutes long. It’s funny what we managed to do with the limited resources we had back then. So right now it’s not so bad. I tell a lot of people, whether you’re from Australia or California or Ohio, we all get on the Internet to talk to our family. My plane ride’s just an extra 10 hours for most people. It’s really not that bad. It’s a small world of technology these days, and we’re able to make the most of it. When you first came to Mooresville, did you know anybody? How did you end up at GMS at that time? When I was racing Legend cars in Las Vegas, Spencer Gallagher was my teammate, we raced for the same team. And T.J. Clark, who was the team owner at the time, he was the mentor for Spencer, and kind of helped move Spencer to Mooresville and start up. At the time, it was ARCA racing and the K&N East Series. So when I decided I moved over here, I called up Spencer and TJ.. and told them my plans, and they’re the ones that offered me the job and I kind of got my foot in the door. Wow, that’s amazing. It would be one thing if you had grown up in Las Vegas or something, but just the fact that you happened to be racing there and then met them, that’s pretty cool. Yeah, it is amazing. With racing, it’s just how much of a tight-knit community it is. Everybody knows everybody and everybody’s helping other people. It’s really cool. Do you feel like with the situation you have now with the racing stuff, you’re going to just keep trying whenever you can to drive and get that racing opportunity as a driver? What’s your plan with it all? I’m definitely not giving up on the driving thing yet. For this season, I’m going to do as many races as I can in the Super Late Model and balance that with the Xfinity Series stuff we’re doing. GMS Racing is doing a lot with helping develop future drivers, getting them through Trucks and up to the Xfinity ranks. I think I’d like to be on board with that and possibly if I’m not driving, help other kids come through and possibly help them race with a Super Late Model. I’d definitely like to see other kids come up, kind of give them the opportunity I had, too. If somebody else was reading this and they’re in the situation, they’re like, “I really don’t want to give up my driving dreams yet, but maybe I need a stable income while I’m still trying to do it.” Would you say that it’s still possible to find a career doing both where you’re able to balance them? Yeah, it’s been very difficult, but the one thing’s that got me through and got me the opportunity to drive the race car is the hard work that it took. It’s a full time job trying to do the mechanic stuff in the Xfinity and Trucks Series. But I’d still work on my Legend cars late at night, and I think the GMS Racing gang and Mike Beam saw that and saw how bad I wanted it, so they’ve given me this opportunity for no other reason at all, really. So I always believed and heard that hard work pays off at the end. You might not always see it, but it definitely does, and I think if anyone has that dream and ambition to keep driving, just keep chasing after it. You don’t know where it will take you. I never thought I’d end up here when I was 10 years old racing go-karts in Australia. And I might not make it to the Cup level, but I’ve had a lot of fun and a lot of good experiences along the way. Actually this offseason is the last time I’ve been home in five and a half years, and so everyone there thought I sounded like an American. I tried to go home for a month and try to get my accent back a little bit. What it means: A deeply disappointing situation for all involved. Gallagher is one of NASCAR’s most entertaining personalities and just experienced the highlight of his career — putting himself into the Xfinity playoffs as a result. It was a great storyline, and Gallagher would have been fun to watch in the playoffs. But that’s all gone now. NASCAR officials indicated they will not give Gallagher a waiver for the races he will miss, meaning he will not be playoff-eligible even if he wins again. 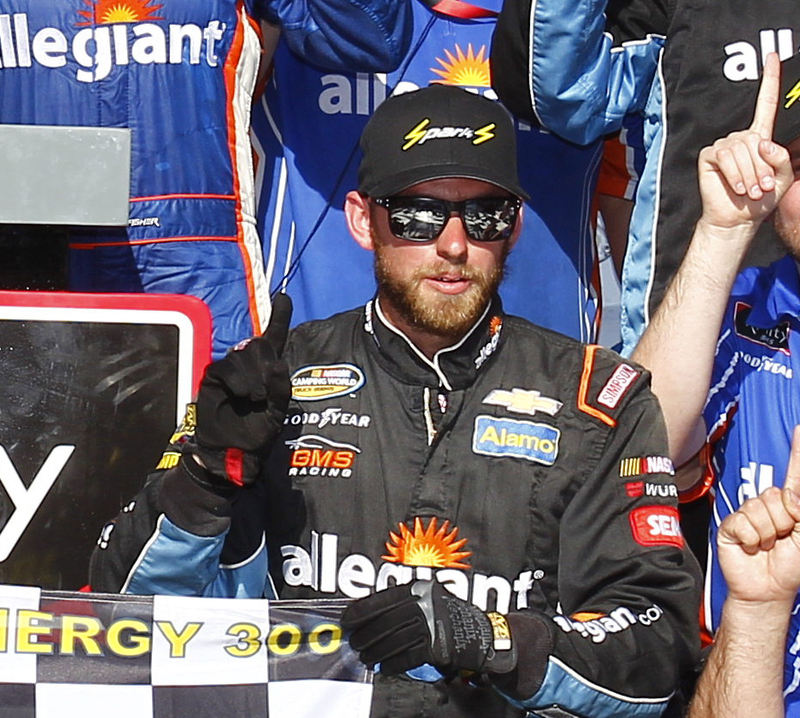 That’s a major setback to both his young career and the race team owned by his father, who is also CEO of Allegiant Airlines (which happens to be an official NASCAR sponsor). It’s unclear how long Gallagher’s time in the NASCAR rehabilitation program will take, but AJ Allmendinger was suspended for eight races after he went through a similar process in 2012. News value (scale of 1-10): Eight. Pretty notable, especially since Gallagher just won and there’s the possibility he could have taken the banned substance before racing (NASCAR isn’t saying either way). This news might be a 10 if Gallagher was a Cup driver in a similar situation, because it would make headlines well beyond NASCAR. Three questions: What was the substance, and did taking it put any of Gallagher’s competitors in harm’s way? Though almost all NASCAR drug tests are conducted at the track, is there a chance this one was done after the victory celebration (when Gallagher said he would “party like it’s 1999”)? Finally, what was Gallagher thinking? The 12 Questions series of interviews continues this week with Johnny Sauter of GMS Racing. Sauter is currently second in Camping World Truck Series points, and I spoke to him at Pocono. The Truck Series heads to Michigan this weekend. I do think there’s a certain element of God-given ability, but I also think there’s a lot to working hard and being smart about what you’re doing. Just because you have ability doesn’t mean you necessarily utilize it the way that you should in a lot of different ways. To put a percentage on both of those, that would be a tough one for me, but I do think you have to have a little bit of natural ability and you also have to work very hard. Maybe because I’m in the same age group as those guys (Sauter turned 39 in May). I’m getting really close to it, so that would be my pitch. Those guys are great race car drivers obviously, but I think a lot of people need to pay attention to the Truck Series. We put on a good show. 3. Let’s say a fan spots you eating dinner in a nice restaurant. Should they come over for an autograph or no? Sure, absolutely. I have no problem with that. It’s happened a few times. As a matter of fact, last night after I was done eating, the people that were sitting at the table next to us came over and wished me good luck and all that. So absolutely, it’s all good. 4. What is the hardest part of your job away from the racetrack? Oh, raising kids. (Laughs) In today’s society, the way things are going, it’s tough to keep them pointed in the right direction. I have a lot of fun. I spend a lot of time with my kids. But I can see that it’s gonna be a challenge as they get older. My son is 7, my daughter is 6 and my second daughter should be 2 in September. And then we got another one coming Nov. 1st. So we’re gonna be busy. That’s a full house right there. (Laughs) Yeah. Four kids under the age of seven. That’s busy. Man, where do you come up with these questions? That’s what I have the offseason for. I’d say just how much work this really is and how much technology has impacted the sport. I know it gets coverage, but when I talk to people even back home in Wisconsin and you tell them how many employees an organization like GMS has, with one and a half Xfinity cars and three full-time trucks, we’re pushing 100 employees. They’re like, “What do they all do all day?” So there’s a lot that goes on behind the scenes, and obviously if you’re not around it day in and day out, you wouldn’t understand totally. But there’s a lot of work that gets done. Just because they all look the same doesn’t mean they are the same. I always look at it from that aspect, just how much work it really is. Erik Jones just a couple of days ago. I’m not gonna tell you what for. Well actually, (Matt) Crafton was wearing me out the other day, but I didn’t respond to him, so I got a mean gesture from him. So you didn’t respond to Crafton and he just shot you the unpleasant emoji? That’s exactly what it was. More than one. But I finally called him back, so he’s happy now. I think in a lot of ways, yes. A lot of people look to race car drivers to not only perform, but to have a good personality or whatever. So that leaves me out. (Laughs) But no, of course, I think people are entertained by this sport, but I also know if you’re not performing, not a lot of people pay attention to you. So it’s a double-edged sword. I try to refrain from using it, but I know when somebody does it to me, it sends the wrong signal to me and I instantly get hot. But I’m not gonna lie, I’ve done it, but I try not to use it a lot. Sure. And to be honest with you, you say that you’re gonna get a guy or you’ve had trouble with a guy, but to me it just goes out the window because I’m just focused on doing what I need to do to be in the best spot I need to be in. But if a guy does cut you a break, absolutely. I actually feel like I think about guys cutting me a break more positive than I do on the negative side of it, just because they don’t have to do that. This is racing and it’s aggressive and you put yourself in positions on both sides of that coin. Yeah, I definitely keep a mental list of people who have raced me clean. But you never forget the guys that run into you, and sometimes you run back into them. I guess it depends on what your definition of famous is. I’ve been fortunate enough to have some pretty cool dinners with a lot of cool people, but I would have to dig deep in the ol’ memory bank to think through the years of all the people that I’ve had dinner with. I’m gonna have to get back to you on that one. I’d have to think about that one for quite a while. 11. What’s something about yourself you’d like to improve — aside from your memory, apparently? (Laughs) Yeah, my memory is bad. But just leading by example. The old saying: Do as I say, not as I do? Well, ultimately you set a good example by doing things the right way. People pay more attention to that than the words coming out of your mouth. So for me, there’s a lot of things I can improve on, believe me. But just ultimately just trying to be a better role model for people and watching what you say and how you say it. 12. The last interview I did was with Blake Koch. His question was: Who was your favorite teammate that you’ve ever worked with, and who was your least favorite teammate that you’ve ever worked with? I honestly have been fortunate enough to have worked with a lot of good guys. I’ve had good teammates, really. I can’t sit here and tell you that there’s a teammate that I did not like. There are guys that you got along with better than others or had more in common with or whatever, but I’ve never really had bad blood or anything like that. Obviously, I’ve spent a lot of time with Crafton and those guys over at Thor Sport and had our fun over there. But I even think back early on with Kevin Harvick and those types of guys, it was good. Of course you want to beat your teammates, but I always had the mindset, “Don’t get caught up and try to beat your teammates, beat the competition and the other part will take care of itself.” But yeah, that’s a good question. But life’s too short to be mad at people, especially when you’re driving race cars for a living and they’re your teammate, it doesn’t make much sense. I don’t know who the next interview is going to be with, but you have a question that I may be able to ask another driver in general? I always am fascinated by the question, “If you weren’t pursuing racing, what would be a career path that you would pursue?” Because race car drivers a lot of times, they get the thrill or action part of it. So what type of profession would they pursue if they couldn’t have pursued a racing career? This week’s Social Spotlight interview focuses on the always-entertaining Spencer Gallagher of GMS Racing. You can follow him on Twitter @23SpeedRacer. It seems like you choose your spots when you tweet. Sometimes, you only tweet every few days but try to unleash a gem. Is that your basic strategy? I’m all about quality over quantity, you know? Twitter is full of enough noise as it is, so I try not to add too much to that. If I’ve got something valuable to say, I’ll say it. But I just try not to let people know what my breakfast was every single morning. I find most people find that boring. So I’m the kind of guy that tries to focus on having a real thought. When I have something to contribute to the conversation, that’s when I speak up. So are you not on Twitter all the time? Or do you look at it and decide not to chime in? I check somewhat sporadically, but I will say I’ve gotten more frequent with its updates. It really is my source of NASCAR news. So I get on there and I check it, but you know, opinions are kind of like elbows — everyone has them and they’re all really awkward. (Laughs) You like that that was a good modification, wasn’t it? Yeah, you really saved that there. Thought I was going somewhere else with that, didn’t you? We could have bleeped it out if you needed me to. That’s actually a good idea. What the hell am I saying? You run your own independent site; you can do whatever you want right now, right? But I try to check often. Whenever I feel my opinion is going to be valuable on a subject or I can contribute some insight, that’s when I try to chime in. I don’t need to tell everyone what’s on my mind at all times, because usually it’s as much nonsense as the rest of ‘em. What type of reaction do you typically get from your Twitter followers? Do you read all your replies? I do. I try to go through every single one of my replies and give back to the fans. That’s the real strength of Twitter. That’s why I like it a lot as a platform — it lets you have a direct connection to the people who are putting their butts in seats to go watch you race around on a Saturday. So that’s something I like to do. Everyone loves seeing that little notification come up. That’s that little hit of dopamine in the arm, when you see that notification come on that someone has touched one of your tweets in some way. It’s really cool. That’s why I like it — it lets you talk to the fans in a very direct way. I think that’s a really cool thing. So how do you deal with the negative side of it? Do you have haters? Do people take shots at you sometimes? Oh God, yeah. Listen — if you’re going to be in the public eye, there’s going to be someone out there that doesn’t like what you’re doing. But I’ll be honest, my way of dealing with it? I remind myself tomorrow I’m going to wake up and drive a race car and they’re not. That’s how I avoid getting too mad about it. If you get mad on the internet, you lose. So I’ve developed a couple strategies for being very zen about my interactions. Everybody is always going to have an opinion and not everybody is going to like you, and that’s life. But at the end of the day, I still get to do what I love. So how much am I going to let their opinion affect me? Do you ever go with the block button? Honestly, no. Because most times, I make it an exercise to find the entertainment in someone like that. That’s my way of helping myself stay zen. If it’s getting really out of hand, then yeah, the hell with you; I don’t need to hear from you anymore. Honestly, most times, I get a laugh out of it. Do you ever mute people, particularly those who you follow but don’t want to offend by unfollowing? I think if the mute function had been around when I was following Kenny Wallace, it might have gone onto him. But no, honestly. If I don’t have the inclination to see what you have to say, I don’t need to follow you. I don’t care about hurting feelings that way. Let’s talk about some other platforms. Do you not have Instagram at all? I keep that one pretty private. I like to keep a couple platforms just for friends and family. I think that helps you create more meaningful moments and more intimate conversations with the people around you. I do post some public stuff to Instagram here and there, but that’s something I try to keep between my friends and family and my close circle. Do you treat Facebook the same way? Yeah, I’ve got an alternate Facebook account (to his fan page). I post sometimes to the public one, but Facebook is the social media platform of record, if you will. So that’s somewhere where I like to be at home, in my loafers — not out in the public eye, so to speak. I get that not everyone likes that. People love overexposure, but that’s something I really do try to avoid in my life. I like to keep my public things public and my private things private. But don’t get me wrong: It’s a great platform for communicating with your fans. But I think a lot of drivers do that, because honestly, dude, you don’t know how many random requests and, frankly, creepy things get sent over Facebook. I think a lot of drivers keep alternate, private profiles — whether they’re willing to admit it or not. Yeah, “Who the hell are you?” Facebook can be a real deluge of people trying to get in contact with you. And a lot of it, you need to reply back to, because it’s a fan legitimately and earnestly reaching out for some communication — and a lot of times, all they want is a card, so I try to get that sent out whenever possible. Some people are a little more obsessive, and that is when they go in the trash bin. But hey, that’s the nature of what we do. You’re a public figure. You’re going to get that kind of exposure. Where does Snapchat fit into that for you? Snapchat is friends and family right now. I’ve considered making it public — I’ve gone back and forth on it. I’m really more of a passive Snapchat user; I just love seeing what my friends are doing at any given time. And I do love recording some moments and sending it out. But as a person, I’m a very in-the-moment kind of guy. I go to a concert and I see all these people holding their phones up, recording, and I’m like, “What the hell are you doing?” You’re missing the whole show because you’re looking at a screen. As much of a nerd as I am, I’m really kind of a technophobe. It’s weird — I know that’s a contradiction — but I’m someone who believes this is a short life and our number of experiences in it are limited, so I try not to experience it through a screen when possible. Yeah. And you know, I don’t want to pass value judgments, but I see a lot of people getting sucked into their screens. I just try to be present in the moment, man. That’s just me. I think it certainly could. When you never shut up about yourself on social media, eventually people get tired. You kind of said it right: It’s supply and demand. When you oversaturate people with information from yourself, you can turn them off. That’s why I try to keep my postings to things I think are valuable and insightful. Because when I speak, I want my voice to be something that provides clarity, something that provides a laugh or entertainment. It’s easy to ruin that by sharing too much. It’s easy to ruin that by oversaturating the people that are listening. As you’ve moved up to Xfinity, I feel like you’re getting more TV exposure. Are you seeing a rise in your replies and more people trying to interact with you? Definitely. The other week, I was on Twitter and I posted something and it instantly got like 10 retweets and I said, “Oh my gosh. Well, would you look at that? I actually have a little following. That’s nice!” It’s one of those humbling things that comes along with rising in the ranks, that people are really looking and listening to what you’re saying — which is again another reason to make sure what I say is valuable. How much do you get in trouble — if ever — for your tweets? Do you ever get slapped on the hand like, “Spencer, you shouldn’t have tweeted that” from your family or PR people? For example: My mom doesn’t like it when I retweet drivers’ curse words from the radio. But no, I’ve kind of learned where the line is and isn’t. And if I think there’s some fun to be had on the other side of it, I ain’t scared of it. But that’s one of those things you save for few and far between. So would it take to get you to do some public Snapchatting? Actually, I have to say, I feel a little guilty about not using my Snapchat more publicly, because I’ve got a pair of the Spectacles that were gifted to me. Oh my God, what a waste! I know, I know. Hate me, hate me. I don’t blame you. But I really need to start incorporating those more. It’s just one of those things: I leave them on my desk and I forget about them. But they’re so cool when I use them. I really need to start getting more (snaps) out. And Snapchat is a great platform for that, honestly. They’re cool, little disposable snippets of life that you can share. So you’re right: Guilt me into it, everybody. I need the encouragement. You seem like an old soul, but you’re still a Millennial, and they say Millennials are down on Twitter and less of them are using it. Do you think there’s a future for Twitter still? And what’s the future for social media overall? I guess I am an old soul, apparently. I rather enjoy Twitter still. I find it an informative, instant platform. It’s a great platform for news, for public conversations, for people to air their thoughts out in a very public way. I like the openness it has. I hope it’s got a future. Apparently the Silicon Valley class to disagree a little bit, but I’ll hope against hope that it keeps going. As far as the future is concerned, Snapchat is trying to get on strong, but man, Instagram is trying to steal their thunder real hard (with stories). It’s becoming more and more difficult to deal with the juggernaut that is Facebook, if you will. I think you’re going to see a continued evolution toward more integrated messaging. There was a grand experiment in network design that really Twitter sort of founded where everybody wants things public, right? I sort of see a little bit of a reversal of that trend; people are trying to bring it in, make it more private circles, more intimate content. I think that’s kind of what Snapchat is bringing along, and Instagram, to a certain extent. Why do you use the @23speedracer name? Did someone already have your name, or did you just think that was cool? Apparently there’s a Spencer Gallagher that’s in the technology industry over in the U.K. I never have contacted him; I really should. We should have a Spencer Gallagher meet-up. Once I saw that wasn’t available, I’ve always like the “Speed Racer” moniker. It speaks to me a little bit, just my career and how I’ve come to be here. So I took it and ran with it. 23SpeedRacer — it’s distinctive and it’s as good as any name, so use it.